Join this small-group full-day adventure tour from the Jurassic Coast to Lulworth Cove and Durdle Door, Corfe Village and Castle! A short walk will find you marveling at the 147-million-year-old Durdle Door coastline. Gaze at arguably the most stunning view across the Jurassic Coast from Portland. Marvel at the wonders of Portland's three castles and the fascinating history it has to offer. Wander through the lovely village of Corfe and its Castle. Then you're off to West Bay where the filming of Broadchurch was filmed. Perfect for a personal tour as you will have time to stroll at your leisure. Cruising back through the Dorset countryside, passing through Corfe Village and a brief stop at Corfe Castle. You leave Weymouth or a pick up location of your choice in the morning from where you head to the village of Corfe. The village is constructed almost completely from the local grey Purbeck limestone and comprises two main streets. Take your time to enjoy a cup of tea or coffee (own expense). The streets are clustered the small collection of shops, the post office, church and pubs. Here you can explore Corfe Castle (own expense). The dramatic ruins of Corfe Castle stand on a natural hill guarding the principal route through the Purbeck Hills. As you can see it guards the gap between the south of Purbeck, where Purbeck marble was once quarried, and the rest of England. Nothing could pass in or out without going past the Castle. Then you are off to Durdle Door. You then have a short drive from Durdle Door to Lulworth Cove. Take your time to visit the Lulworth Visitor Centre and learn about the phenomenon caused 147 million years ago. Walk along the Natural World Heritage Coastline and the challenging hills. Lulworth Cove was formed approximately 10.000 years ago by the awesome powers of a river and the sea. You then head to Portland where you see three castles, Portland Bill and the stunning view across the Jurassic Coast. 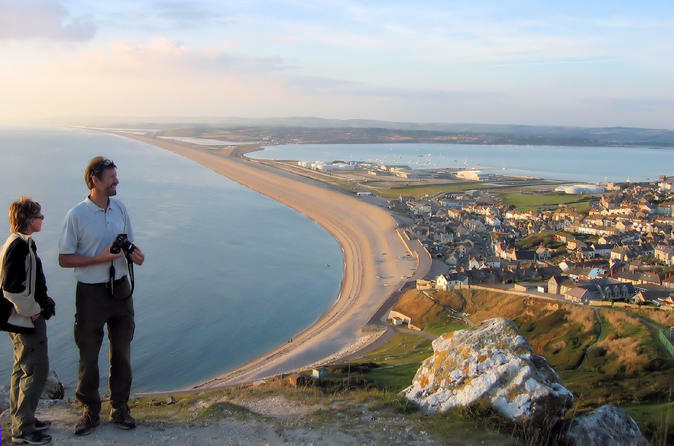 Then its back to Weymouth and a trip up the Veiwing Tower to see the spectacular views of Weymouth. Lastly you visit the West Bay where the hit TV Drama Broadchurch was filmed and again see the stunning Jurassic Coast before returning back to the location of your choice.